Villa Baratto is a newly built holiday house with pool in modern/rustic style located at the edge of the village Barat, approx. 15 km from Porec and its beaches. 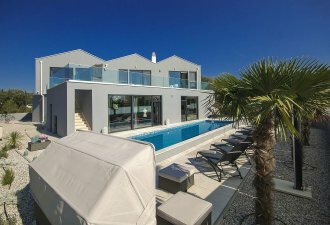 The villa has been built in the year 2014 and is situated on a 1.500 sqm enclosed property with lawn and olive trees with a nice panoramic view on the vineyards, forests and the sea. The panoramic view is highlighted through the large windows in all rooms of the house. The specific feature of the house is the connection of the living room and the garden/terrace area which, thanks to the large windows, are connected into a unique outdoor/indoor living room. In order to upgrade the comfort of the guests in the house there’s an audio system with 6 loudspeakers, large fireplace, attractive combination of modern and massive antique furniture as well as different stone details through the house. The villa Baratto offers its guests the following outdoor features: private parking places for 2 vehicles, 32 sqm large swimming pool and sunbeds. Villa with pool for 6-8 persons with 160 sqm large living area on two floors. It consists of the ground floor with fully equipped kitchen and a spacious living room with a two-persons sleeping couch, open fireplace, dining table, one air-conditioned double bedroom with queen size bed and shower/toilet, separate toilet. On the first floor there are two air-conditioned double bedrooms, each with queen size bed and it's own shower/toilet, fantastic panoramic seaview and exit to the common terrace with sitting set. Schöne Einrichtung Blick zum Meer.Freundlicher Vermieter. Werden wieder kommen.